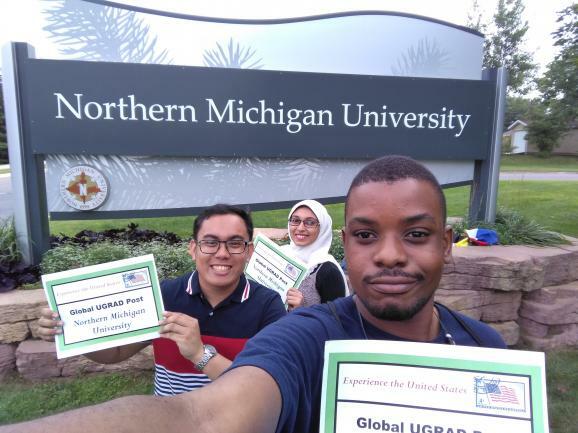 Bruno Amilcar of Maputo City, Mozambique in East Africa, is one of three students attending NMU this fall through the Global Undergraduate Exchange Program (UGRAD). The program is designed to promote cultural exchanges between American institutions of higher learning and foreign students. Amilcar is a junior political science major with a minor in theater. He is anticipating his upcoming role as Father Christmas in the NMU production of Scrooge! The U.S. Department of State assigned Amilcar to the UGRAD program at NMU through a scholarship. Amilcar said as a member of the LGBTQ community, and since coming out at 17, he is always up to do something that encompasses protecting the rights or people in that community. “It’s really amazing attending the [NMU] ALLIES meetings. I’m learning a lot with the LGBTQ community in America,” he added. Some of Amilcar’s favorite memories at NMU so far include making friends that come from different states and working with former Broadway actor and Professor Paul Truckey at Forest Roberts Theatre. Amilcar said he ultimately wants to help others by working in social services. He plans to land an internship with the United Nations hopefully, and eventually land a job at the U.N. headquarters in New York City. The International Education Services Office at NMU is collaborating with World Learning to bring students from other nations to campus for cultural exchanges. This aligns with the university’s strategic focus area of global outreach.